Let's review what's going on here: This is a Model T. It's powered by a Boeing T50/Model 502 gas turbine, the same thing the government once put in helicopters and anti-submarine drones. Now you can buy it on eBay. Gah! What is it with pre-war Ford people and amazingly cracked-out engine swaps? How does this happen? What prompts an owner to do something as brilliant as this? And if he's on some sort of excellent illegal substance, how would we go about getting a sample? Let's cut right to the chase. This thing has a control stick. A control stick. It is a cyclic stick, and it once lived in a Bell 47 helicopter. It also has an ex-Learjet throttle quadrant between the seats. And a Sunstrand hydrostatic pump taken from an International Harvester 715 combine. And a 400-cubic-inch accumulator for steering boost. And an automatic shutdown function in case of low oil pressure. And it makes my brain hurt. And and and. I have never built anything like this. I have a sudden desire to do so, but maybe purchasing would be more cost-effective. Of course, at that point, I'd have to convert the whole thing to AN plumbing and mil-spec wiring components. Maybe paint it olive drab, add some stenciled warnings, install a Gatling gun on the back, invade a few principalities. Did you know that Boeing built just 2,461 Model 502-derived turbines from 1947 to 1968? Did you know that more than 300 of them were used in armored Swedish military vehicles? Did you know that, according to Boeing, a Model 502 weighs 625 pounds, burns 32 gallons of fuel per hour at maximum output, and will deliver 300 hp in what we can only assume is combat trim? Did anyone else notice that the fuel tank is a pair of pony kegs? 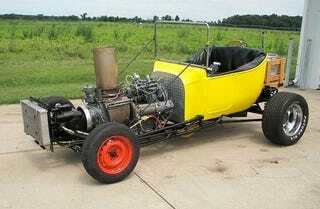 You think a man with a turbine-powered T-bucket could start his own junta?